There may have been similar posts on here in recent years, but I just don’t recall a spring that I have been more excited to hit the woods chasing turkeys. – Deer season ended too long ago – and the 2012 season saw me hit the woods fewer days than any other season over the last 20 years. – I’ve had a chance to see more turkeys already this spring than I recall over recent years – especially in my home state of NC. – My hunting buddies keep posting pictures online of the turkeys they’re already killing in states that have already kicked off turkey season. – I’ve not had a chance to kill a turkey since 2011. – My local hunting buddies’ interest in turkey hunting is rising at the same rate as the NC population of thunder chickens. – My preseason scouting trip reminded me of my love for opening a morning to the sounds of a gobble. One other reason is worth mentioning. If you read this blog, you know I’m a big fan of Midwest Whitetail productions. 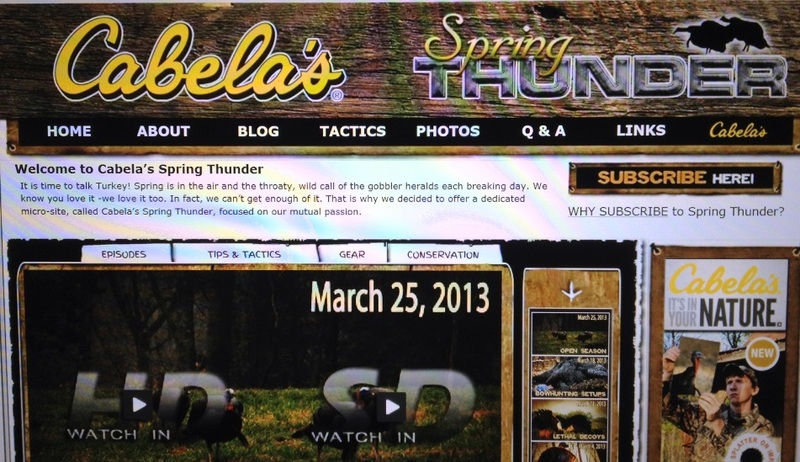 And the same group of producers for that semi-live online hunting show have created a similarly themed turkey show, Cabela’s Spring Thunder. Host Aaron Warbritton does a great job in the role and it’s easy to see that he and his turkey hunting cohorts know what they’re doing when it comes to chasing turkeys. Here’s hoping we’re connecting on a few chases here over the next month. We’ll certainly keep you posted on when that happens! Don’t forget to “Like” our page on Facebook. Just click here. And keep us all posted on how your turkey season is going! This entry was posted on Tuesday, March 26th, 2013 at 10:57 pm	and tagged with Aaron Warbritton, Cabela's, Cabela's Spring Thunder, Midwest Whitetail, turkey hunting and posted in 2013, General Tales, Gun Hunting. You can follow any responses to this entry through the RSS 2.0 feed.